Pies, grunts, slumps, buckles, crisps, crumbles and brown bettys are all names for fruit desserts but what is the difference, if any, between them all? They all rely on cooked fruit combined with sugar, butter and flour in some combination, with pies being the most well known and commonly found. The average pie has a bottom pastry crust, fruit and optional top pastry crust. Crumbles, crumb toppings or streusels are baked on top of a fruit base. Crisps are basically crumbles but with the addition of oats. Brown Bettys are crumbles (or crisps) that have a layer under the fruit as well as over it. A buckle includes a cake-like batter under the fruit which rises up around the fruit as it bakes. The name refers to the fact that the fruit tries to sink during the cooking process and makes the batter look like it's buckling inwards. Cobblers are baked with the fruit on the bottom and individual biscuits on top. They puff up during the baking, resembling a cobblestone street which is the basis for the name of the dish. Grunts, also called slumps, are exactly the same as cobblers with one notable difference. Whereas cobblers are baked in the oven, the grunt's biscuits are steamed on the stovetop. The name grunt refers to the noise the dish makes as the fruit bubbles up during cooking and the name slump for the way the biscuits slump down when served. Whatever you call them, this class of fruit desserts is ideal when you don't want to turn on the stove because it's too hot or when one is not available. For this reason, grunts are great for cooking over a campfire. The steamed biscuits of the grunt have a different flavor and texture than a cobbler so which you prefer depends on your particular taste. The other thing that all these desserts have in common, other than the fruit, butter, flour and sugar, is that all are wonderful served with a scoop of ice cream on top! Add the blueberries, sugar, lemon zest, lemon juice, cinnamon and salt to a large skillet or braiser with a tight-fitting lid. Stir to combine and cook over low heat for about 5 minutes. Combine the flour, sugar, baking powder and salt in a large bowl. Cut in the chilled butter with a pastry cutter or fork. Note that you can also grate the butter on a large box grater. Gently work the butter into the flour mixture and stir in the buttermilk. 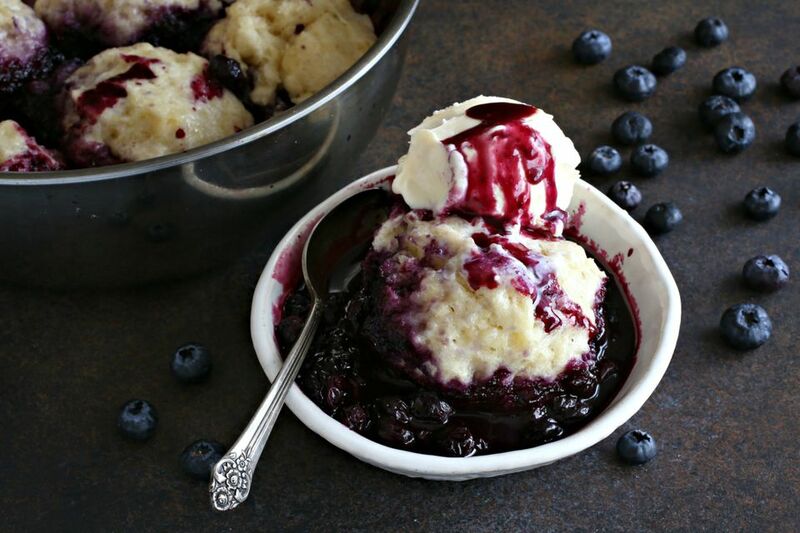 Drop the biscuit dough, using an ice cream scoop, onto the hot blueberry mixture. Cover and cook on low heat for about 15 minutes until the biscuits are done. Serve with vanilla ice cream.